This morning, Craig provided a nice overview of the upcoming Spiderman musical, Spiderman: Turn Off The Dark, and the reasons that it might turn out to be an unmitigated disaster. The embarrassingly bad name, the $65 million dollar budget, the technical difficulties involved in getting Spiderman to fly across the theater, all have Broadway producers holding their breath. 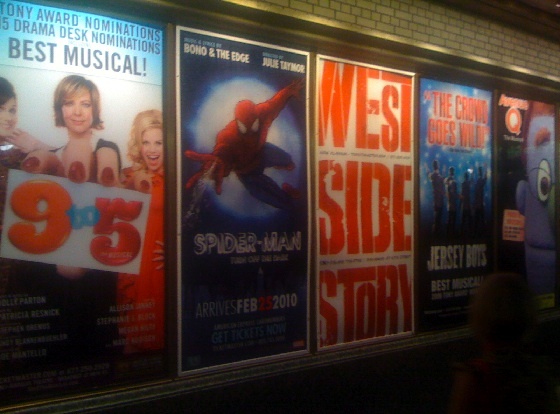 The show has attracted more attention than any other Broadway production scheduled for 2011 (even Trey Parker and Matt Stone's Book of Mormon musical, a ready-made controversy if there ever was one, isn't getting as much press). The day after Spiderman's first preview for critics, the show sold more than a million dollars worth of tickets. But the producers of Spiderman need to cross their fingers and hope these sales continue; it's going to take two years of full houses and upscale ticket prices to recoup this investment. (The show is going to cost $1 million dollars a week to put on, and NPR reports that this is more than twice the weekly cost of any other Broadway show currently running). And, as Craig pointed out, the critics seem less than thrilled with the production. In an interview with NPR, producer Manny Azenberg seemed somewhat taken aback by the negative publicity, likening the crowd of detractors to "vultures sitting on a tree." He added, "Everyone is rooting for this failure, in some perverse way." I know this sounds awful, but I'm also rooting for Spiderman: Turn Off The Dark to fail. Not because I'm opposed to the concept (though I can't say I'm a big Spiderman fan). Not because of the awful title, not because I have anything against Bono, not because I take offense to a $65 million dollar show in the midst of a recession. But simply because Spiderman will be infinitely more entertaining and memorable if it flops hard. There's something strangely compelling about the big flops. Students of pop culture know their names very well - Cleopatra, Heaven's Gate, Ishtar, The Adventures of Pluto Nash. These aren't your run-of-the-mill bad movies. These are disastrous bombs that leave an indelible mark on the cultural landscape for years to come. Spiderman might be setting itself up for this kind of infamy. The stories that surround it already are almost too good to be true - the initial producer dropped dead of a heart attack literally just as The Edge was about to sign his contract (he had the pen in his hand). A large contraption that sounds like one of Wil E. Coyote's slingshots sent a hapless stuntman catapulting across the theater, breaking both his wrists (he's since recovered and returned to work, but the state of New York might shut down the more elaborate stunts due to unsafe conditions). This is the stuff that box-office bomb legends are made of! This is the sort of production that sounds like a terrible idea from day one, but somehow continues unabated through all sorts of crises that would have put an end to lesser flops. At one point, the entire production went bankrupt, essentially losing the producers $25 million. The show started from scratch, with only Bono's well-financed friends saving the show. Julie Taymor, in New York Magazine, refused to talk about the finances of the show. She considers herself an artist, above such quotidian concerns as money. She claims that nothing else like her vision is being produced. That might be true, but only because her vision seems to be style (expensive style) over any sort of substance. Taymor seems to believe that by merit of throwing large buckets of money at a show, this means the show is automatically worth seeing. It might be a form of cultural schadenfreude that I (and many others) are entertained by this impending disaster. I don't mean this cold-heartedly. I don't want anyone to be put out of work, I don't want any burgeoning Broadway producers to go bankrupt, and I don't want to make Bono cry. But I see plenty of passable, mildly entertaining fare every day. In a way, it's pretty easy to make a safe, palatable work. But Great Flops take special talent on their own, talent that can be appreciated for what it is. I sincerely enjoy watching Waterworld, as terrible as the movie can be. There's a fine line between greatness and utter disaster. The greater the artist's vision, the easier it is for that vision to lose its balance and go toppling over. In many ways, these bombs are more entertaining than normal, formula-driven forms of entertainment. They're certainly more memorable. If a movie is just okay, I'll probably say I enjoyed it and forget about it in a few weeks. But a grandiose spectacle of a show - whether a masterpiece or a disaster - will remain in my mind. Bad productions are usually quietly put to sleep, released with minimal fanfare or shelved for years at a time. But high-profile disasters like Spiderman have their own momentum. There's no stopping it, even though everyone can see where it's headed. Flops like this require a good deal of talent, money, hubris, and an uncanny ability to misread the cultural zeitgeist. As such, they are very rare. So I give credit for Taymor and Bono and the Edge for trying something different. It sounds like the show is at least going to be interesting. 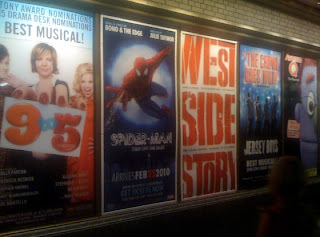 If it turns out to be an all-right musical, I'll wish them all the best, and probably never get around to seeing it. But if the musical continues down this path to spectacular failure, I'm going to need to get myself a ticket before the entire production goes under.